Step One: Assemble your materials! 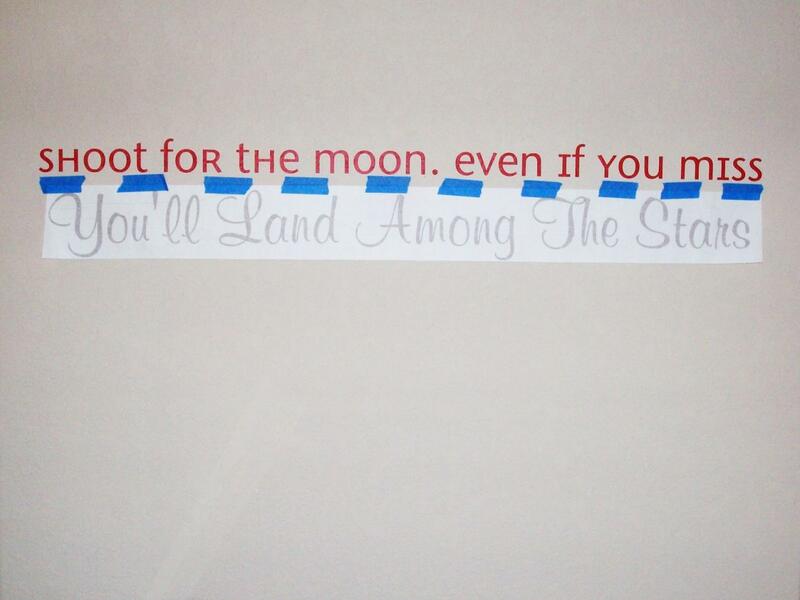 Let the quotes lie flat because they come rolled up. -Caitlin’s Thought: Roll them backwards. Problem solved, and time saved! 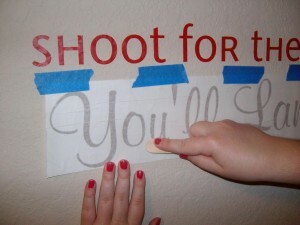 Step Two – Mark Your Space! Use the level or measuring tape to determine exactly where your quote will go. 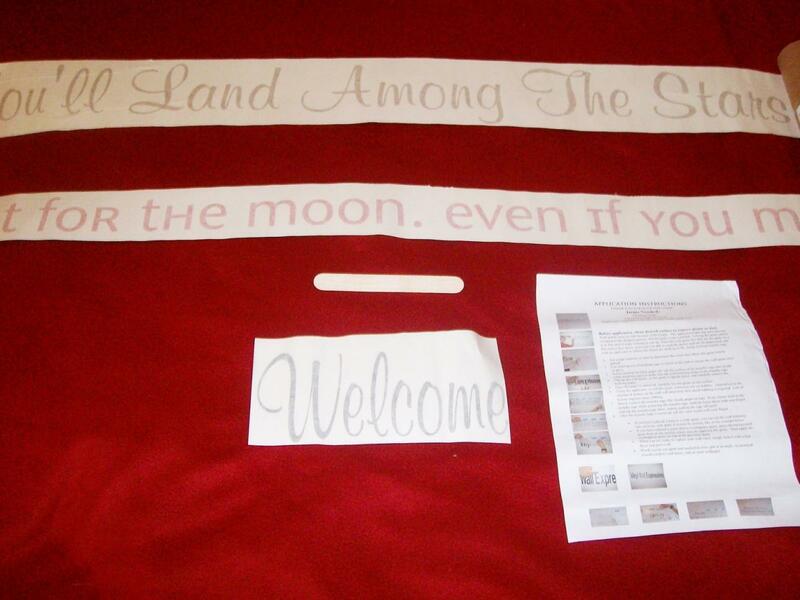 Step Three – Place the Quote! 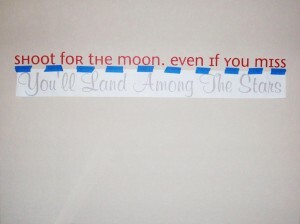 First, use the masking tape to tape your quote to the wall, facing forward. Think of the quote like a sandwich – on the bottom you have your back paper, then the actual letters of the quote, then the transfer tape on top. First, use the masking tape to tape your quote to the wall, facing forward. Think of the quote like a sandwich – on the bottom you have your back paper, then the actual letters of the quote, then the transfer tape on top. -Caitlin’s Confession: Influenced by my less-particular sister, I didn’t actually use the level I recruited. We eye-balled it. Second, you’ll do your 1st Rub. Use the applicator to rub the letters, with it still encased in the transfer paper. (It’s still a sandwich). My wall was highly textured, so I had to rub and rub and rub and rub. Second, you’ll do your 1st Rub. 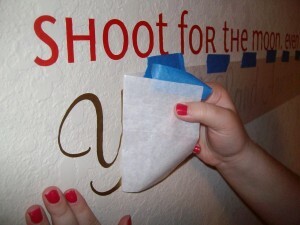 Use the applicator to rub the letters, with it still encased in the transfer paper. (It’s still a sandwich). My wall was highly textured, so I had to rub and rub and rub and rub. Just flip it on itself, so you can remove the back paper. 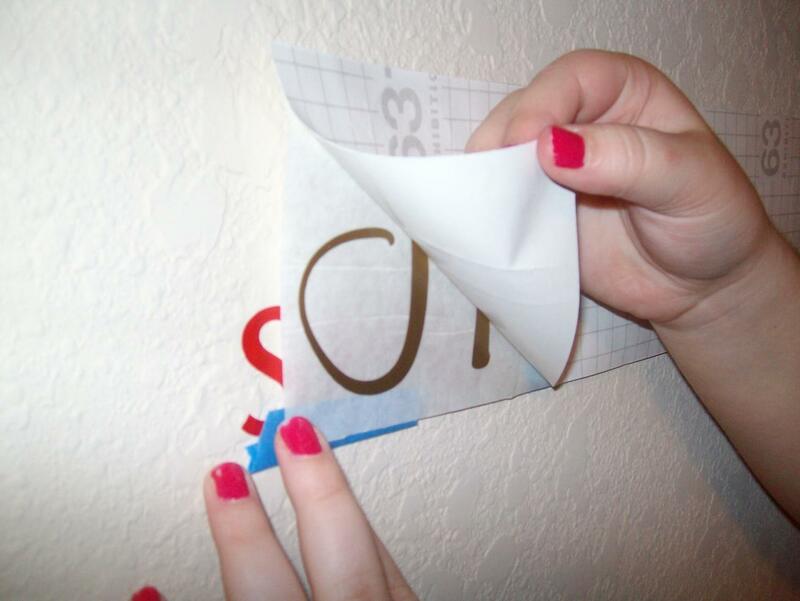 Peeling the transfer paper apart from you vinyl wall letters. These moments matter – so make them count. Do it slowly and become that obnoxious perfectionist version of yourself. Take full advantage of this because right now, you have permission! Sixth, now remove the transfer tape – carefully! 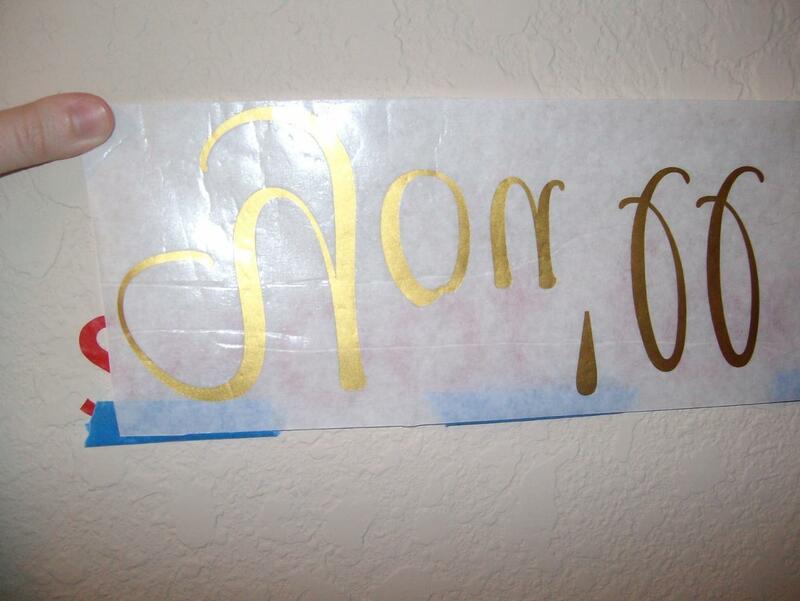 We had a problem with the letter “Y” not wanting to get off the tape, so be cautious. Finally! Stand back, and check it out! I loved the colors of our quote! They came out beautifully bright and mesmerizingly metallic – a lovely mix. Admire your finished wall expression! Initially, I was intimidated in spite of my excitement to dive into decorating. Crossing the threshold and doing my first Vinyl Wall Expression opened my mind to the endless possibilities of decorating walls and other surfaces (windows, cars etc.) 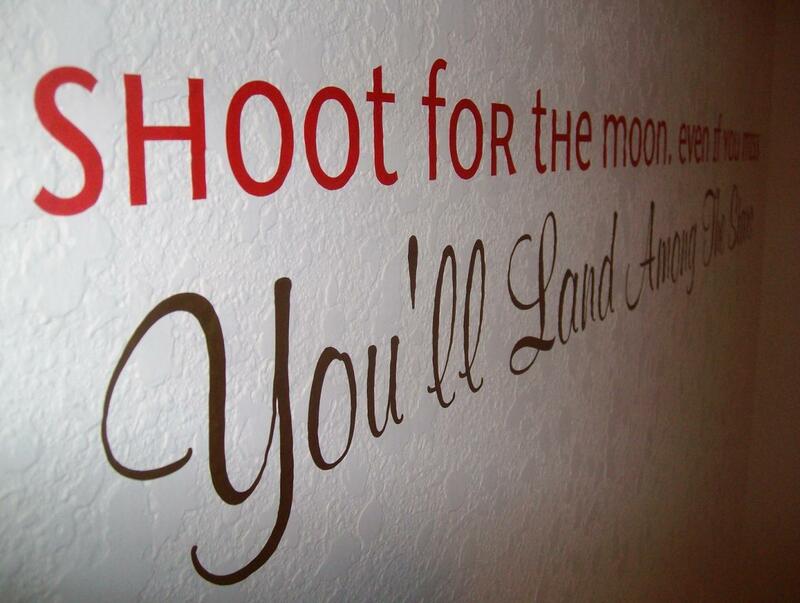 And undeniably, my future holds many more Vinyl Wall Expressions! Hi Peggy–Just email [email protected] and we can help you out. Thanks! 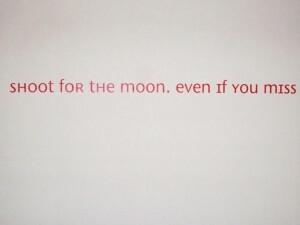 I would like to do this for a wedding wall. How do I remove the vinyl. Also can I reuse it again later? Vinyl Lettering is easy to remove, you can warm it up a bit with a hair dryer on low, and then peel off. 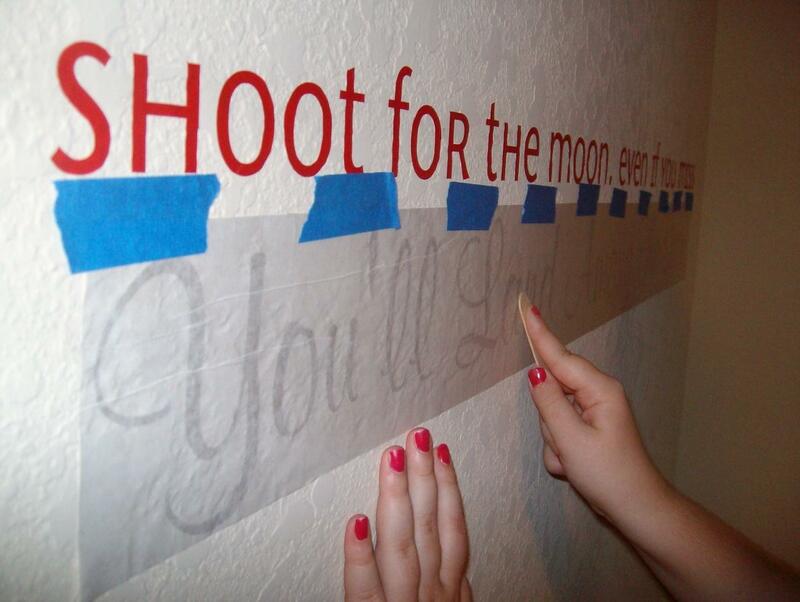 You vinyl wall quote is removable, but not reusable. I have a room with high gloss walls that seem to repel anything that you try to stick to them. For example, in the how to install, the blue painters tape shown in the diagram simply won’t stick to the wall. It just peels right back off. Have said that, my question is, even if I figure out how to get past that obstacle, will I have a problem with the vinyl letters sticking at all? Hi! We fear that if painters tape won’t stick to your wall, that the vinyl won’t stick either. 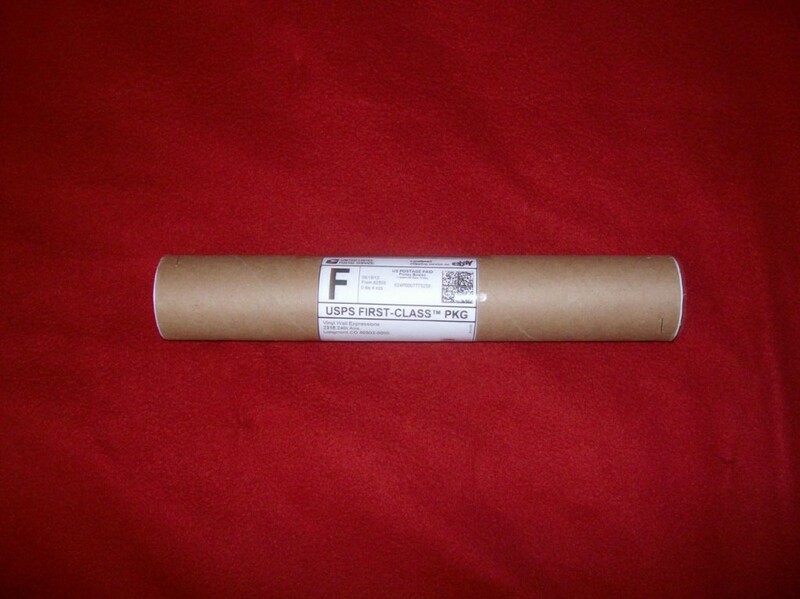 But if you connect us through our contact page with your address, we can send you a vinyl sample to try it on your wall. I wanted to add a piece of art to my vinyl writing, would that be possible? what are you wanting to add?